It was while visiting Taiwan in 1983 that I first read of the etheric connection between heaven and earth. According to tradition there were places where positive (yang) qi would pour into the earth from the sky. Men and other (sometimes non-corporeal) entities, who wished to develop their spirits, would sometimes search out these places and sit quietly there (in meditation) for the purpose of more rapid spiritual advancement. At the time this was nothing more than heresay to me. During that year I had opportunity to see many Buddhist and Taoist temples on the island, and had observed that they often were situated over positive lines of qi through the earth. This was so frequently the case that I acquired the habit of looking for the lines of qi through the earth whenever I came upon a new temple. In late August and early September of 2001 I met with some Chinese friends of mine to visit some of the Taoist and Buddhist holy mountains in China. One of the Taoist mountains we visited was Hengshan in Shanxi Province. At one place there, we came upon a temple which was built on the side of a steep slope. One wall rested on the ground, and the other was on wooden poles. As our vehicle approached I automatically checked for qi lines about the place, but found none. Since there was level ground not far away, it seemed surprising that the builders had gone to the trouble to construct it on the sleep slope, almost a cliff. After parking, while walking over to the entrance of the place, I noticed that positive qi was coming down from the sky directly through the roof. We were told that there had been a temple in that location for time immemorial, and that it had been owned solely by one group: Taoists, Buddhists, and Confucianists had all use the place at one time or another. We walked through it and I found that the place the positive qi entered the ground was near the back wall, and that that particular place had been used especially for quiet sitting. In fact there was a depression in the rock there for that purpose. Another mountain we visited on that trip was near the Shaolin temple. This is in the Songshan range in Henan Province. Tradition has it had in the early 6th century the Buddhist sage Da Mo visited the temple and found a place on a mountain nearby where he sat quietly for 9 years. That particular temple is know for its martial arts, and it is said that Da Mo was the one who taught the monks the system which made the place famous. In any case the place where Da Mo is said to have meditated is still known, and many pilgrims climb up that mountain yearly. We hiked up there as well, and I was surprised to find that, as at the temple on Hengshan, positive qi streamed out of the sky above into that place. It was in March of 2003 that I discovered some of the Crofts’ adventures on the internet, and built a CB according to Don’s published plans. It was a surprise to read that the Crofts lived only ten miles away, so I emailed Don (who was on a trip on the East Coast at the time), asking if we could meet. He said sure, but that most of the “action” involving CBs was taking place on Stuart Jackson’s cloud buster forum. So I registered and began posting daily observations of how qi in the area was interacting with my CB. Here negative qi was coming down from the sky (and in from the earth) and positive qi was sent back up into the sky. I became “hooked” on studying and working with these phenomena, especially as I became aware of many details resulting from my daily observations of which I had never read or hear before. In the summer of 2003 these observations led to the discovery of what I have come to call vortices, though this is a specialized use of the general term, and different people use that term for different phenomena. What I have since come to view as the typical vortex of this type occurs on the earth’s surface, often at a place of high altitude relative to the surrounding area, where qi from below ground comes up and concentrates. This qi contacts the surface at a few points, and if TBs or HHGs are placed at those points, positive qi comes up through the surface and swirls upward in the the shape of an inverted cone. The first example of such was at Steptoe Butte, and I published the events connected with the “opening” of that vortex on the cloudbuster forum. Several other vortices were opened that summer and fall, including Moscow Mountain, but it wasn’t until the next summer (2004) that I began instill some order into the process and began to get a better idea of its significance. Some of these things were published on the cloud buster forum, and some on Mark Davey’s EFF forum in England during 2004, but both of these forums have since been discontinued. When this Etheric Warriors forum came into being, I began publishing observations here, but the severe hacking of Etheric Warriors in the late fall of last year resulted in all of that material being relegated to the archives. Subsequently I have been posting “Heaven and Earth” material on Warrior Matrix and Georg Ritschl’s german language cloud buster forum. Not everything on the former has appeared on the latter, and vice versa. So what I purpose to do in the present thread is to collect much of this information together, in a comprehensible body, exposing the state of my understanding of, and experiece with, the passage of qi between heaven and earth. The very first vortex I observed in the early summer of 2003, as a result of my CB observation, was not that on Steptoe Butte, but one near the wheat elevator at the Almota landing on the Snake River. It was about a 45 minute drive from my CB, but negative qi swirling up out of it was clearly observable from the location of the CB at the time. I of course did not know its exact location until driving there. The river at that point is down in a steep canyon, and it was not until reaching the river that I could ascertain the center of the vortex. The most important point touching the surface was actually in the river some distance off shore, and so I could not reach it directly. Don and Carol told me that they thought it was connected somehow with an underground base. In any event, it was rather difficult to gift effectively. My initial efforts were only temporarily successful, and I had to regift it several times that summer, to keep the qi coming up positive. Somehow the grain trucked down to the elevator seemed to contribute to the negativity, and Carol suggested that it might be a result of the pesiticides which are sprayed on the land during the growing phase. Again in December of 2003 the vortex had turned negative. I had read a post by a lady named Gale (Wild Angel) in the old forum suggesting that a crystal in orgonite in a copper pipe might be a powerful gifting agent. And so, just before Christmas, a friend of mine and I took a pipe, some resin, some hardener, metal shavings, and a crystal down to the other side of the river from the elevator; found an inconspicuous spot, buried the pipe, poured in some shavings, then the crystal, then some more shavings, mixed some resin with hardener, and then poured the mixture into the pipe over the shavings. So far as I know, this was the first earth pipe constructed (and perhaps the only one poured on site), but it did the job. The qi coming up from the vortex has been positive ever since. I was “rewarded” by incurring a bizarre accident on the way home, and totalling my pickup. Neither my friend nor I were injured, but we should have been: after the pickup flipped and was sliding on its side, we both saw another car headed the opposite direction coming directly at us, but there was no collision. Bad luck and good luck. But the vortex on the Snake was not typical, in the sense that the first time I saw it, it was emitting negative qi. The typical vortex is nearly dormant, in that it is seeming “clogged up” and emitting no qi. It was in the hot part of the summer of 2003 that I discovered my first typical vortex. One of the two highest hills in the section of the Palouse Hills where I live is Steptoe Butte, the other being Kamiak Butte. While riding to Spokane with Don some days earlier, he had informed me that Steptoe had been gifted, but it still was not as good as it seemingly should be. So one night after work, I jumped in my pickup and drove up there, arriving about a half hour before dark. There was only one other party on the butte at the time, and so I could wander about pretty much unobserved. I found two places near the summit where the qi beneath the surface actually touched the surface, and placed a TB in each of these points. It was dark by the time I reached the main highway, but it was possible to sense positive qi swirling up from the summit. The next morning the action was much stronger, and was clearly perceptible from my home about 25 miles away. Positive qi was swirling up in the shape of an inverted cone, counter-clockwise when viewed from above. It still is the strongest open vortex in this part of the Palouse, and I can feel it as I write this, just as strong, if not stronger than it was when first opened the better part of three years ago. That such an effect could arise from precise gifting of two spots, when the general area had already been gifted, was quite impressive. In those days I was only beginning to learn how to charge TBs to make them more powerful, and the potency of the two I buried on Steptoe was only slightly better than a simple TB with no extra charge. The vortex on Steptoe Butte was typical, but in the top 10% in terms of strength, which may account for it being the first dormant one I discovered. In 2003 Don and Carol Croft were living in Moscow, Idaho, which is right on the border of eastern Washington, in the Palouse country. Though hilly, it is is a rich agricultural region, producing wheat, peas, and lentils. The University of Idaho is in Moscow, and 10 miles away in Pullman, is Washington State University. North and east of Moscow about 10 miles lie the so-called Moscow mountains, the largest of which is Moscow Mountain. I was doing a virtual Hitler-style victory jig when Kelly and I saw that rapidly forming rainstorm over Moscow Mountain a couple of days ago. I live ten miles closer to the mountain than he does and have generally been involved with the thing since May, 2002, when Carol and I trudged thru deep snow for over two hours to largely disable a huge tower array on the next lowest peak from which we and the rest of the valley were being electronically savaged 24/7. Carol and I had been meaning to get back up there and finish the job. We weren't even aware of the status of the vortices at the two highest peaks, so when Kelly brought it to my attention last week, I asked him to try some of his new, watered orgonite jive up there and handed him a Latah County map. He arrived at 4PM, as agreed, to help me get some plywood cut up in his nice, big shop over in Pullman, ten miles away. Within five minutes of his arrival, the sky got darker in the vicinity of Moscow Mountain and by the time we’d driven through town to the lumberyard, it was raining hard on the mountain itself with occasional lightning strikes. Rain was being dumped from fast-formed cumulonimbus clouds and we even got pelted with a little hail from an arm of the storm that was forming into the prevailing breeze. There was NO strong wind accompanying this phenomenon, which would cause any meteorologist’s brain to fart, no doubt. That year was rather a full one for me, and since I no longer have access to my notes, it is possible that the time line of events for the remainder is not exact, but I will reconstruct them as well as I can. I was making and distributing CBs to friends of mine in the area, and one of those CBs was placed on the property located on a ridge above the Potlatch River behind Kendrick, Idaho. This was one of the first that I made of the "torsion" type, and was the first of three which would eventually be placed in a triangle, with sides roughly a hundred yards in length. I mention this here, because an event about a year later was in show that this configuration, in one significant respect at least, was to exhibit an effect very similar to that of an opened vortex. In early September on a trip to Seattle, a friend of mine and I opened a dormant vortex on Volunteer park. About three weeks later I was in Seattle again visiting family, and found and treated one in Green Lake. Those are the only ones of which I know in the city proper. In early October I took a trip down south to visit relatives. On the way I drove through Mount Rainier National Park and found and opened a dormant vortex on one of the lesser peaks, and opened a vortex on a peak of Mount Shasta. There were actually stronger dormant vortices on the summits of those mountains, but I did not have the time or equipment to attempt to reach those places. A friend of mine and I found and opened two on hills in San Francisco. Carol had told me that Sedona, Arizona was special, so on the way back I passed through that town. There were many dormant vortices in that place, and during the space of one day I was able to visit about 7 of them, as I recall. The last one was several miles out of the city limits, and coming back over a ridge, just before dark, I was surprised and awed to see the clouds in the sky arranged in a spiral shape, above the swirl of positive qi from the opened vortices. That was one time I wished I carried a camera. They had cleared some forest near the top of the butte, on the far side from town so that nobody would see the bonfire, and there's a huge burn pile in the center of the clearing which Carol says contains the bones of several victims. In Episode 67 Don writes about a "safe-house" of suspicious characters. He showed me its location, which is on a ridge just across a small valley from this butte with the vortex. When I first saw it, some time before gifting the vortex, there was negative qi exuding from the house. Some time after the vortex was opened, I drove by the house again. It was abandoned, and there was positive qi coming from it. On October 27, I made another foray into Mount Rainier National Park, this time out of Paradise Lodge, and managed to open a number of vortices in that area. If one would look at the seismological charts of Mount Rainier on the day previous, the day I was there, and the days following, he would find a radical increase of seismic activity beginning about 4PM (when I left the mountain), only lessoning gradually in the following days. These graphs were linked on EFF at the time, but the data seems no longer to be readily accessible. The weather was bad that winter, and I did not get out much more until the following spring. In January, during a break in the weather, Don, Carol, and I took a trip down to Joseph, Oregon, where they had heard of some suspicious doings (I had also heard of such from an independent source). The trip is described in Episode 78 of their Adventures. The material of the preceeding posts is mostly of “Earth” and very little of “Heaven”. This is partly due to the fact that until early 2004 I had no knowledge of the spirits of the air. There had been a discussion of sylphs on the clould buster forum back in 2002, but having joined in March of 2003, I did not know about it. But in early 2004 sylph activity apparently increased and it began again to be discussed on the forum: notably by DB , or cbswork, as he was known at the time. Many of his sylph comments were collected by Jon (dor2or) in his blog, which can be be found on John’s excellent “whale” site. Today at 5:00pm I saw my first Sylph. I wish I had my camera with me. It was directly over your town. It must of been using the POR from your CB’s. One interesting note, there was a wall of clear blue sky around it, 30 miles in diameter. On the edges you could see the chemtrails disappearing. It seeme to be watching the sunset with me while I was driving down HWY 195. It was a very beautiful sunset too. Several days later, driving down the same highway from a business trip to Spokane, I observed my first sylph as well. It was not far from Steptoe Butte. I wished it a merry hello, and immediately the good feeling came back at me several-fold. I have since found that instant reaction in kind from these creatures to be quite normal – and that they seem to love to abide near potent sources of positive qi (or POR). Don and Carol had suggested that a visit to Dulce, New Mexico would be in order, so when the last danger of the snow was gone at home, I took off in that direction. The negative qi was observable from there as far away as southern Utah. I arrived at night, found a few vortices, and continued on into Arizona. Decided to wend back through southern California to set up a torsion CB in a friend’s house in Pasadena, and on the way passed through Sedona to check on the vortices I’d visited the previous fall. They were pretty much as I had left them. While in Pasadena I made the acquaintance of DB, though several things occurred to keep that from happening: broken teeth, traveling to the meeting in the wrong direction, etc. But it eventually did happen, and in his back yard he demonstrated to me how sylphs could make the wind come up at their will. It was quite an experience. Thence it was back to the Palouse to attend to the busy period of spring work. But I did manage a second trip down to Joseph, Oregon, this time with McGinty.We managed to do some more good, but it was still too early to reach everywhere we wanted to gift, and there still remains some work to do there. My wife had never been to Europe, though I had been to the British Isles with my parents years before. We decided to spend a couple weeks in England and Scotland, with a few days out for a quick trip to Sweden. She wanted to spend a few days in London to begin with. I recalled that Westminster Abbey and Saint Paul’s Cathedral were two of the more interesting sites in the city, from the etheric point of view. The qi in the Abbey was somber and solumn, coming from deep below: here is where coronations have been held for many generations. The Cathedral is light with positive qi: there is where royal weddings are often held. We visited both, and climbed the stairs in the latter to the outside gallery which gives a good view of the city. From there was observable a strong dormant vortex, and we were fortunate, for it turned out that in that city of stone and concrete, the surface contact points of that vortex were such that we could gift it. On the train north to Stansted where we were to take our flight to Sweden, the open vortex was plainly “visible”. Our stay in Sweden was hectic, due to social obligations, and we had no chance to chase vortices before our last night there, in Göteborg. We had dinner in a modest vegetarian place in the old part of town with a young man who was destined to become a good friend and valuable asset in vortex gifting. This was Cesco, who had come down on the bus from Oslo to meet us, and who had camped out the previous night in the woods. From his capacious backpack he extracted a notebook. For at the beginning of the year he had taken a twelvemonth vow of silence, and he kept that vow. So that night we spoke and he wrote. The conversation was more fluid than one would expect however, for his English was good and he writing beautiful (and legible). I had known him from internet communication, his “little secret coil” having excited my admiration. After dinner we decided to take a walk, and leaving the restaurant I became aware that there was a dormant vortex on a hill not far off. So we went off in that direction and found a point where the qi of the vortex touched the surface. After gifting it, we were approached by a bird, which seemed to want our attention. We followed it until we came to a second place where the vortex qi touched the surface, at which point the bird flew off. After a bit Cesco accompanied us to the hostel where we were to spend the night, and we had a good “talk”, during which he tried (unsuccessfully) to teach me to make his coil. He caught the bus back to Oslo in the wee hours of the morning. The next day my wife and I took the plane back to Stansted, whence we set out by auto toward Leeds, where a meeting of British “orgonauts” was to take place several days later. Coming into Leeds we were “welcomed” by an impressive display of sylphs in the sky. This was neither the first nor last time I’ve had that experience. It is almost as if they sense when one needs encouragement. We made it to the city, and two days later attended the meeting. There were representatives from Ireland and Wales as well as England, and a good time seemed to be had by all. One of the participants Marcus, who will appear again in this narrative, had come all the way from Switzerland. The group planned to go the following day to Ilkey Moor, on which was located some interesting stones with prehistoric writing. My wife and I had to leave early, but decided to visit Ilkey Moor on our way. The weather turned bad and I came down with a fever (which persisted for the remainer of the trip), which is my excuse for forgetting to bring some TBs when we visited the moor. We regreted the oversight, because there was a strong dormant vortex at one of the stones. We however left markers at the spots where the qi of the vortex touched the surface, and I called the information back to the group so that they could gift the places the following day. From there we headed west to the Lake District, and spent the night on a sheep ranch. From luck or design, there was a strong dormant vortex up on the hills above the farmhouse, and our hosts gave us permission to go hiking. It was a bit of job to get to the vortex, but the climb/walk was quite picturesque, and we managed to return just at dark. Next morning we drove north into Scotland, and eventually ended up in a B&B on the isle of Mull just across from the historic old monastery at Iona. Dunx, one of the British “orgonauts” we had met, had spoken to us of a serious experience he had had in Iona, and this had led us to visit the place. When we arrived off the little ferry the next morning we found, sure enough, a strong dormant vortex. We gifted it surreptitiously, and after a half hour or so an array of sylphs appeared across the water over Mull. Our next journey was north to the isle of Skye, and up near the north of the island we found another vortex. After spending the night in the neighborhood, we headed south again. After crossing over onto the mainland once more and driving 20 miles of so, my wife had me pull over so we could take a photograph. For coming from the direction of the vortex was a singular array of wispy clouds: these were not sylphs, but still an interesting confirmation. Thence to the south, where our last stop before leaving was Avebury. It was only a couple days after midsummer, and we were told that there had been quite a crowd there on Midsummers’ Eve. When we arrived at the prehistoric site, the weather was stormy: such wind and rain that nobody was out in the open. This was good for me, for I was able to walk out to the site at the end of the old path, and unobserved gift the dormant vortex there. It was actually a few rods distant from the remains of the ceremonies which had been held on Midsummer’s Night. Thanks for repairing the archives Webmaster! I will paste selections from them (mostly from the article Mica Peak) in green 10 point type. Some weeks after returning from Europe, I was helping a friend construct a pole building up on a ridge near Kendrick, Idaho. Some months previous we had placed two torsion CBs on his property, about a hundred yards apart. Due to the success I had had extending positive qi using TBs place in a triangle, I was curious to see what the effects of a triangle of CBs would be. So I made another and brought it with me to work one morning. There was a positive line running through the ground not far from the building site, and since I had not tried placing a CB on such a line previously, I decide to place it on this line overnight, to see the effect. Next morning early I found that the CB was working more strongly than usual. A little later a helicopter appeared, which for a half hour or so, circled about the boundaries of my friend’s 400 acre place. He was impressed…. We removed the CB from the positive line and took it down to where the other two were, and made a rough equilateral triangle. https://www.palouse.net/laozu/L…..t; I saw that night, as I drove home, more true sylphs I had ever seen before, or have seen since, to date. Next day they were gone, but the day after appeared something which seemed to be related, but which was clearly different. High in the heavens – considerably higher than the domain of both clouds and sylphs – was a broad and long collection of positive qi, and inhabiting that sea of qi seemed to be a great number of very positive beings. Nearly two years later, while returning into South Africa from Zimbabwe, Georg Ritschl and I made a rough calculation, using elementary trigonometry, of the height of a similar sea or canopy of positive qi, and found it to be about 30 kilometers above the earth’s surface. It has been discussed elsewhere how sylphs seem to enjoy the presence of CBs, and perhaps use the emanating postive qi as “breath” or “food”. I have no direct information on this, but it has been my experience that high-level positive entities seem to be attracted by good positive qi. Perhaps it the postive canopy I first observed on July 23 gave a thriving habitat for these positive beings in the vicinity of earth which they had not had before? I do not know for certain, but it is my guess. After several days I was able to make a reasonable estimate of the extent of this positive canopy of qi: it was about 60 miles long by about 15 miles wide. It was roughly the shape of an ellipse and, interestingly, it was approximately the smallest ellipse which contained all of the previously opened vortices. Mica Peak is the most puissant visible vortex in the Spokane area but until yesterday had never been opened up. Don and Carol had gifted about the base, but due to the paucity of roads up to it (it seems to be the highest peak in the area too) and the fact that those are posted and blocked off, they’d never been up to the top. There are some towers and a weather dome up there, and each time I saw it driving up to Spokane, it nagged me to do something about it. It literally begged to be freed up. The huge high POR cloud (with high level entities) which covers the sky from east of Kendrick, Idaho to Stetoe Butte in Washington has not seemed inclined to spread up to Spokane. I opined that a fully functioning Mica Peak might be an enticement. Anyway, Mica was gifted yesterday. Took a three and a half hour hike, after which, just before dark, the surface points of the vortex were reached; and a five hour return trip (due in part to being lost in the dark on the mountain). When I left the area at 2AM the POR was whirling up from the peak. Will try to report on its progress, if any. I love reading about your gifting adventures ! [September 24, 2004] Drove over to the Lewiston Grade whence I could see the Lewiston valley, drove up US95 (most of the way) to Spokane, and then back home on US195, so I got a fair idea of the present extent of the canopy. In the following map, the six blue squares represent approximate location of healed vortices. The area enclosed by black indicates the extent of the canopy before Mica Peak was healed. The area enclosed by red indicates the extent of the canopy before the latest two vortices were healed. The extent as viewed today is indicated by the yellow curve. Where I could see no further, but did see that the canopy extended to a certain place, I used dots rather than a solid line. [September 27, 2004] Don and Carol told me about another likely vortex location, so I took the afternoon off and drove up to Clarkia, Idaho. On the way up I found that the town was quite near the eastern boundary of the canopy of POR. Sure enough, there was a restrained vortex on a mountain about 9 miles east of the town. As has been the case recently, the way there was not so difficult as it might have been. Carol had told me that there was believed to be a “portal” in the vicinity, a place though which spirits could pass (was the way I understood it). On the way out, several miles north of town in the woods, was a pleasant tower of POR. Hiking in to it, I found that the patch of ground under it was singular in that qi was slowly flowing into it from all directions, and nothing seemingly flowing away. Perhaps this is characteristic of portals? One other thing was unusual about it. I was clearly directed not to gift the area. On October 12, while driving to work on the pole building again, my eye happened to catch the top of a pine tree along the side of the road, and there seemed to be some unwonted positive qi in the tip. Looking more carefully at other trees along the way, I noticed that this did not seem to be an isolated phonomenon, that each living tree had some positive qi in its upper part, from just inches to more than a foot. [October 14, 2004] The POR has penetrated down into the tops of the trees about three times as far as was the case Tuesday. There is no such POR in dead trees, telephone poles, or other non-living vertical objects. And the POR does not seem to be entering the tips of the horizontal branches—just the vertical ones. [October 15, 2004] The positive orgone in the tops of the trees in this area extends down about twice as far as yesterday. It is now a little more than a fifth of the height of most of the trees. [October 17, 2004] Goes roughly a third of the way down the trees now. [October 21, 2004] Drove up to Spokane today and found that penetration of the positive qi into the trunks of the trees was pretty uniform: from the tip about 45% of the way down the trunk. Strangely, not much of it has entered the lateral branches thus far. [October 23, 2004] Finally travelled beyond the POR canopy today to observe trees. A few miles outside the edge there was already no positive qi entering the trees from above—a strong indication that the qi is coming from, or has some connection with the canopy. [October 26, 2004] Here the POR has penetrated into the trunks over 50% of the way to the ground now. A couple days ago a rather powerful vortex was opened up a bit more than a hundred miles from the present boundary of the canopy, which is roughly twice the distance Mica Peak was from the edge of boundary at the time it was opened. [October 31, 2004] Today, 6 days after the a vortex about 100 miles to the west of the canopy was gifted, the canopy has extended about a third of the way to it toward the west. A second vortex was gifted today, about midway between the two. The trees under the center of the canopy now have positive qi about two thirds of the way down from their tops. I’ll try to take a photo tomorrow to illustrate. [October 31, 2004] Below is the photograph of a birch tree in the neighborhood, taken this morning. I have used red to indicate the penetration of POR. I used the birch rather than one of the spruces in the background because the absence of leaves makes it easier to illustrate, but the positive qi penetration into the birch is characteristic of the trees in general here. [November 5, 2004] Five days later, I have updated the qi penetration into the birch tree, using brown to extend the red. [November 13, 2004] Eight days later. The POR has now penetrated all the way to the base of the trunk, and has spread out into the ground in a disk of about a foot radius about the trunk. However it has still not come out to the tips of the branches. As time progressed, the positive qi eventually entered into the surface earth from the trees, although to date, not too deeply. Subsequent observation has shown that he qi entering any given tree seems to come into only one branch, and that branch is almost always the one that points most straight up. Except for that branch, positive qi only reaches other branches from the trunk, and then only slowly moves out to the tips. This phenomenon has turned out to be helpful when observing later extensions of this canopy, or other canopies, to estimate how long the canopy has been present in a given location. The term “second” refers to the order in which I observed it – I suspect it was actually in existence earlier than the one described above. [November 14, 2006] Was down in California last week visiting family and friends. The furthest south I reached was Pasadena, which is north and west of LA. I was mildly surprised to see another positive canopy, similar to the one up here in the Northwest, extending south from Santa Clarita (about thirty miles north and east of Pasadena) south over LA. I don’t know how far south it reached, but it went as far as I could see in that direction. I say mildly surprised, because I know that cbswork and the LA gang down there have been doing a great amount of gifting, probably more than has been done anywhere else. [November 18, 2004] In the first part of the trip down south a couple weeks ago, while still in Eastern Washington, I inadvertently became aware of negative qi far off to the west and south. It ran roughly north-south, though at the time I did not think to ascertain which direction it was flowing, or even if it had an appreciable flow. Throughout the first day on the road I checked from time to time to try to locate its source. When dark came somewhere in Oregon I still had not found it, and due to a particular distraction the following day, I neglected to attend to it. On the way home at the end of the trip, my attention turned back upon it, and the source was discovered. It may not be prudent at this time to say how it was the source was found, nor where the source was, nor who gifted it. But I will say that it was somewhere in California, and that quite rapidly after it was gifted, the trail of qi turned strongly positive. I did attempt to descry whether and whither the qi was flowing. It seemed to be moving in a northerly direction in a band. Several times I passed under it and the width of the band seemed less than several hundred yards. Viewed from a distance (and it can be detected from over a hundred miles away), this band of positive qi, or POR, seems to be not exceptionally high in the heavens. The gifting was done a week ago tomorrow, and though the length of the band of qi was in excess of 500 miles, I was not able to tell where, and in what manner, it ended. Curiosity got the best of me, and so after a fews days of rest, I drove off to discover where the stream of positive qi came to its end. I found it yesterday at a place in Western Washington, and it ends rather abruptly. But all the trees growing beneath it, and the land below, seem to be suffused with positive qi. Furthermore the canopy of POR which previously had been over a hundred miles distant, had extended so that, in Washington at least, it was above this POR stream. Qi had already entered the trees growing under the extension of this canopy, approximately 40% of the distance down from the top. The stream of positive qi does not run through Seattle, and in fact ends some distance from it. However I found that the high canopy of POR has passed over the Columbia River in that city’s latitude and now extends to the eastern shore of Lake Washington (which bounds the northern part of Seattle on its western border). Again in this area positive qi seems to have penetrated into the trees roughly 40% of the way. I do not know what is happening here. Don told me he thought the POR band may be a part of the earth grid, and that it has returned to what it once was and should be. I don’t know, but I am awed. There seems no good reason now not to remark that the source of this river of qi was near Lassen Peak, and that cbswork gave me the tip. Later other such rivers turned up, and they all see to have the property of attracting and expanding canopies of qi which happen to be not too far away, to themselves. This is somewhat curious, given that the heights of these rivers of qi above ground is usually much less than a kilometer, and that the canopies see to be up about 30 kilometers. I will be including selections from Warrior Matrix in brown 10 point type: mostly they were written in the third person. The following gives a bit more detail for the trip across the State to see how far into Washington the “river” extended. After several days at home, he [Laozu] drove back across state to the coast, to observe the course of the qi-stream. He found that the POR of the qi-stream ended somewhere in the general area of Centralia, Washington, and that under that stream, trees and plants seemed to be filled with POR. Furthermore, the positive canopy had extended greatly in the sourthern part of Washington up to the edge of the qi-stream. He traveled over White Pass, which runs just to the south of Mount Rainier, and found that in the trees on the pass, the qi had penetrated about 40% of the way down the trunks: this was on November 17th. It was not clear to Laozu why the positive qi-stream stopped where it did at the time, for it did not seem to run up, down, or to the side. Interested to observe the shape of the positive canopy he drove north toward Seattle. The edge of the canopy receded away from the freeway to the east but then came closer again as he neared Lake Washington. It actually reached the eastern edge of Lake Washington just south of I-90, the main east-west route between Seattle and Spokane. He suspected that this was due to several things: that there were a number of CBs in the Seattle area, that Seattle had two strong healed vortices (Green Lake and on Volunteer Park), and that there had been considerable gifting along I-90 by a number of people. The following map gives a rough description of the positive canopy as of that time: the boundary is in blue, and the qi-stream is represented by a red line. The dotted lines are just estimates and not actually observed. It had now turned into snow season in the Palouse, and I had to stick pretty much close to home until February. When the weather seemed appropriate I decided to see if I could extend the river of positive qi. [February 6, 2005] This last week Laozu made another trip to the Coast. He found that the positive canopy had moved across Lake Washington and covered Seattle. On the eastern side of the city, the qi in the trees extended all the way down to the base. On the western side, it was only down about 15% from the tips. The change from before is indicated by the green line on the map. He went down from Seattle to observe once again the end of the qi stream. He found that it had retrerated several miles, but at the point to which it had retreated was a latent vortex. That vortex is now healed, and after the healing the qi-stream looked like it was extending further to the north. The estimated path is given by brown on the map. Since Laozu did not have much time to remain in the area and observe, the reliability of the brown line is not great at this point. On the way back home another latent vortex north of I-90, which seemed to have been impeding the spread of the canopy north, was healed. In February of 2005 Cesco, whom my wife and I had met in Göteborg the previous summer, came to the US, and took a bus from the East Coast out to the Palouse to visit us. We went vortex hunting in the Northwest …. [February 19, 2005] Esteemed coil-maker and mountain man Cesco, fresh from the great northern wilds of Iceland and Scandanavia, visited Laozu this past week on his US tour. They traveled to the Puget Sound region for purposes of observation and vortex hunting. The qi-stream was found still to be continuing positive to the north, passing into Canada over Vancouver island. It is drawn on the map as passing through near Victoria, but since Laozu was not close enough to be very accurate, this is only a rough estimate. As of Thursday, February 17, the positive canopy had spread to the north at least as far as the dotted orange line. This seems to be the result of the positive qi stream, in conjunction with a vortex opened in north central Washington two weeks ago. Two new vortices were opened this week: one in the North Cascades and one east of the orange line in Montana (which was the eastern edge of the canopy most recently observed). This last one seemed to have been one of the strongest to date. To send him on in his US tour, I decided to drive Cesco down to California and the Southwest. Our first interesting vortex on the trip was in Eastern Oregon, on a mountain southeast of the city of Pendleton (famous for the Pendleton Roundup and woolen goods associated with it). We could not see our object directly for the hills, and so climbed the wrong mountain first, only to find that the dormant vortex was on the next mountain over. So down again, and up again, we went, over rocks, streams, meadows and steep slopes. We had all kinds of weather that afternoon, from sun (a little) to stormy rain, gusty winds, and drizzle. We met a good-sized heard of elk, which was gathered not far from the vortex, and only fled upon our near approach. On the way down, after opening the vortex, several eagles appeared, circling the vortex. About half-way down Cesco slipped and injured his ankle: not seriously, but enough to slow down our vortex hunting for a few days until it healed. Coming across the California border headed south, there became visible a second river of negative qi, running north. We followed it down into Southern California, and found its source in the mountains not far north from the prison town of Lampoc. DOR2OR, who lives in Lampoc, joined us for dinner in Ventura. We told him about what we had seen, and since Cesco’s ankle was not up to a climb yet, DOR2OR agreed to help me track the river to its source. I left Cesco on his own in LA, DOR2OR went looking. That was the spring of the big rains in Southern California and the dirt roads into the mountains were too sloppy to drive on. So we ended up hiking in to the base of the mountain source along the railroad tracks. It was a several mile walk, and then a hike up through the hills. Eventurally we arrived, after using up the better part of a roll of surgical tape on blisters, and enjoyed the view, as well as the gifting. After a brief stay with family in Pasadena, Cesco and I continued on into Arizona. His ankle had healed to the point that we could pursue our vortex gifting once again, and we worked our way up to the Grand Canyon, which he and I saw, both for the first time. We came there ready to gift, but the place was so spectaculary good, we decided any additions we could make might perhaps only muddy up the fountain. [March 10, 2005] Cesco is now gone, but before departure, he and Laozu attended to vortices in northeastern Oregon and Arizona. Furthermore, on the trip down south they found a line of negative qi in the air beginning just south of San Jose that extended several hundred miles down the California coast. It reminded Laozu of the line going acress Oregon to California which was transformed into a positive river of qi last fall. Cesco had other business to attend to so DOR2OR generously accompanied Laozu in gifting the source, supplying his knowledge of Southern California geography and roads. Passing through LA, Laozu noted that the positive area in the heavens above that city is still there, but it does not stretch as far west as Pasedena. He did not travel south of LA and so does not know how far south it extends. Laozu returned home passing north through Utah and eastern Idaho to Butte, Montana, so that he might observe what, if any, were the effects of February’s gifting of a vortex in the area of Missoula, Montana. He found that the positive canopy presently extends nearly as far east as Butte, and in the Bitterroot Valley near Missoula, covers the sky as far as the eye can see in any direction. The observed eastern boundary of the canopy (as of this morning), is colored with yellow on the map. Laozu looked at the positive qi in the trees at Deer Lodge, Montana, just west of Butte, and saw that it was about 30% down from the tips. At Missoula it was about 40% down. [March 29, 2005] Laozu was down in Southern California this past weekend and went on another fun expedition with DOR2OR, this time through a thicket of brush that seemed like a continuous hedge. Fortunately it was not too hot, and Jon mostly led the way with his trusty cudgel. The source of qi which they they had found three weeks earlier was now sending positive qi streaming to the north. Laozu traced its course, more or less, on the way down south and the way back north, and found it was not on a straight line, as he had assumed the earlier river of qi was. That part of it passing through Oregon is roughly indicated by a purple line on the map. Laozu has not yet had opportunity to follow it much further north than the Oregon/Washington border, so its putative extension into Washington is indicated with a dotted line. The vortex which opened three weeks ago in Eastern Oregon has hooked up with the postive canopy of qi high overhead, and this canopy now extends so far south as Eugene, Oregon, and as far west as the newly opened river of qi. The sourthern boundary of the canopy is indicated on the map with a black line (dotted again where guessed rather than observed). Back down at the source (some miles north of Santa Barbara, California), Laozu noted an interesting phenomenon. There was a positive canopy of qi which extended to this source from the southeast. When first observed last Thursday, it covered highway 101 from about 26 miles north of Buellton to as far south as visiible from Santa Barbara. Since Laozu did not travel any further sourth, he cannot say for certain, but he is of the opinion that this canopy is an extension of the one he had observed over LA in his earlier trip. Under the canopy, positive qi will descend into the tress, pass into the vertical tips, thence through the trunks into the ground. This last process is reminiscent of the water cycle: from ocean into the sky, down again in rain, and eventually back into the ocean through streams and rivers. Turns out the thicket of brush was poison oak, and I had worn loose shoes with no stockings. The effects did not appear until returning home a day and a half later, but then they made up for lost time. DOR2OR was similarly hit, and we both know now, what poison oak looks like, and that it merits great respect. That spring at the Crofts’ house in Moscow (Idaho) I met Ed, a gifter from Japan, who was on a visit to the US. We hit it off at once, and he invited me to come to Japan to gift vortices. Cesco and I had also gotten along quite well, and my heart told me to take these opportunities “by the horns”. In the mean time I had become acquainted via the Internet with John and Rich, they were both postive about me visiting them in the UK. I arranged to visit Ed in the autumn and to get together with Cesco to attempt to open a positive canopy in Central Europe in the summer, following a brief stay in England. Cesco arrived in England the day after myself, in the latter part of July. Rich picked me up at Heathrow, and we gifted our way to John’s place on the Welsh border. Johns place has been in his family since the Norman coming nearly a millenium ago, and a significant part of it must look as it did back then. The ancient and majestic trees (with their Devas), the woods, fields, and red deer are wonderful. John was out mowing when we arrived, and he showed us around the place. The next day he drove to Stansted to pick up Cesco, who flew in from Iceland, and so Rich and I spent the day gifting vortices in the neighborhood. [August 9, 2005] Timely and inspiration visit from Kelly and Cesco. Kelly discovered that a CB placed on a black energy line would convert it to positive, which a TB, HHG and Earth Pipe wouldn’t do, not to this nasty line anyway. It remains to be seen if this is lasts. This, incidently, is the holy grail of geopathic dowsers, who seem to rely on a copper rod up to now. When the CB was put on the line they changed from being like hissing alley cats into grim silence, and the last time Kelly looked they were crying , so I hope the line was the reason they were there, or the anchor for them. Also that, IMO, is another holy grail of house/geopathic dowsers, being able to remove nasty spirits (and I don’t see how you can clear a house effectively without dealing with negative lines) One friend refused to go in the cellar, so not something to have in your house. Unfortunately the picture above seems to have been lost. Since then, we have made other tests placing CBs on negative lines of qi in the ground, with the lines turning positive afterwards. At this time I cannot answer the question of how far from the CB the effect extends. However we do know that when another negative line crosses such a line, not far from the CB, it also will often turn positive. Later we found another, and easier, way to change a negative line to positive using 6 TBs. [August 21, 2005] Cesco and I owe many thanks to John and Rich for there wonderful hospitality during our brief sojourn in England, and for picking us up at the airports and driving us to vortices about Herefordshire. John’s place is like no other we have seen. It is if it were taken out an illustration of a fairy tale book, or as if one were taken back to England of the 10’th century. When Rich and I arrived the first day at John’s place, he took us on a short tour of the place, and toward’s evening we got to the field with the negative line. John asked if the qi in such a line could be changed, and I don’t recall which of us thought of the idea of burying a CB on it. But next morning before going to Stansted to pick up Cesco he transferred a CB he already had to the line, and when we four checked on it that evening, it had turned positive (at least as far I could see in each direction). As reported above, a smaller CB turned out to do the job as well. Besides experimenting, John took us around the region in which he lives opening vortices. By the end of our visit, we had covered quite a bit of territory, but our stay was too brief to see if our work had born fruit in the guise of a positive canopy. Creating such always takes longer than extending one. It would be the best part of a year later until I would have a chance to observe again. Our plan was to forge a positive canopy in Central Europe, which could subsequently be extended in any direction. We flew from Stansted into Frankfurt-Hahn airport in Germany, about 120 km west of Frankfort, and drove south to Heidelberg, where we were to begin. Von Grauenstein, kindly invited us to stay in his (and his mother’s)apartment there for the night. Next day he drove us to several dormant vortices in the neighborhood, and to the remarkable holy mountain Heligenberg, which is situated within the city. Our host (and friend) in Heidelberg took us to nearby Holy Mountain (Heiligenberg). Von Grauenstein is his name on the German forum. 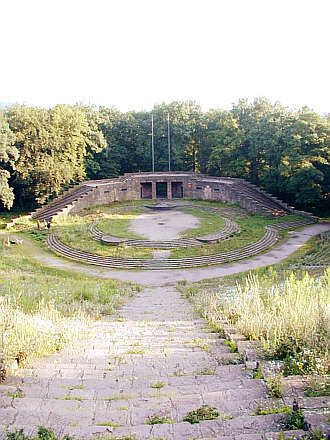 One can drive up to within several hundred yards of the top, and near the parking place is an amphitheater constructed by the Nazis, back in the 1930s as I recall. Having reached this point, I could clearly feel a very positive presence up on the top of the mountain. 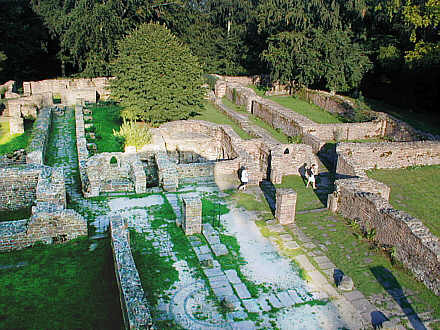 We climbed up above the amphitheater and there were the remains of an old cloister, or monastery (dedicated to St. Michael), which had stood abandoned since about 1500. It was easy to see why the monks had originally put their cloister there, however, because of the strong holy presence there. It was a place of power, which is why, I suppose, the Nazis used it. Lower down, in the focal point of the seats of the amphitheater, was a nasty feeling negative entity. Cesco asked me if there were any lines of qi in the ground, and in fact there were two. They were negative, came down from the left and right sides of the amphitheater in a symmetric manner, and crossed at the focal point, or speakers place. We gifted one of the two lines with 6 TBs. Both lines turned positive, and later, when we left, the negative entity did not seem to be there anymore. Von Grauenstein invited two other German gifters in the area, Hunting Vegi and CB-Ray, to dinner with us, and we had quite a pleasant and informative evening. CB-Ray lived not far from Stuttgart, which was the next good-sized city on our route, and he graciously invited us to spend a night at his house. It was there that a suggestion from Cesco led us to finding that a negative qi line in the ground could be changed into a positive one using 6 TBs. …… Cesco and I were in Germany visiting CB-Ray, a member of the German orgonite forum. There was a negative line through his living room, and there was also a CB planted just outside the house on that line. Given our experience in England, this seemed quite strange, so we decided to remove the CB and see what, if any, changes would occur. Rainer (CB-Ray) began to remove the soil from about the CB and found four very strong magnets which he had forgotten that he had placed in the ground about the CB to increase its power. As soon as he had removed the magnets, but before he removed the the CB, the line turned immediately positive. There was another negative line in his house, but there was nowhere outside on that line which was suitable for placing a CB. Cesco suggested that we try placing TBs in a circle on the line. After some experiment we found that 6 was the optimal number. However it made a difference what the diameter of the circle was, as to how strong power of the TB-configuation was. In this case, the optimal was about a foot, as I recall. Just putting the 6 on the circle in the house helped somewhat, but the line remained a bit negative. So we went outside and buried them in the ground on the line, in the circular configuration with the proper diameter. The result was a quite positive line. CB-Ray took several days off from his job and drove us about the region hunting vortices. It was there that we learned about Germany’s excellent road system, and that if one knew the way, he could drive to within about a quarter mile of anywhere he wanted to go. This of course speeded up our progress. Several of our targets were old castles on mountains, and it was a quite picturesque couple of days. We gifted quite a few places in the few days were were there, and were both surprised and elated to find that on our last day there, a positive canopy had shown itself. I say elated, because that meant we now had only to extend it, and so did not need to gift so densely (frequently). We continued east, staying with Rusty (Roland) and family in Munich, eventually reaching Salzburg, Austria. We then turned back west, traveling along the southern boundary of Germany. We stayed a night near the Bodensee with Grey Owl (Odyssee) and friend, who drove us to a vortex nearby. Then it was into Switzerland, where we met Hans, who showed us around his region of that country, and treated us very handsomely. When I first began posting on Georg’s forum, my German was even worse than it is now, and one Swiss member Hans took pity on me and sent me an electronic German dictionary. Cesco and I were making a circuit through southern Germany and northern Switerland, gifting vortices, and Hans very graciously hosted us when when got to his neck of the woods near the town of Aesch in the vicinity of Zürich. Not far from Aesch is a monument honoring the Swiss soldiers of World War I. It is on a pyramid shaped base, and there is a metal sculpture resembling a flame standing on the middle of the base. Hans thought it was a bit strange, and so brought us to take a look at it. He was correct. It was strange. At right angles to each of the sides of the base there were lines of qi running through the ground. These lines were negative, and from each of the four sides negative qi was moving toward the center. Furthermore negative qi was entering into the metal sculpture from above. And there was a negative entity within the sculpture at the bottom, seemingly absorbing all this negative qi. So we buried six TBs, in the shape of a circle of the proper radius, on the worse of the lines coming out of the monument. Not only did that line turn positive, but so did the other one, and positive qi began flowing into the monument from all four directions. And negative qi no longer flowed from above into the flame. From the base we saw a vortex off in the distance, so we left to tend to it. After about an hour we returned. By then there was positive qi entering into the top of the sculpture, the negative entity had gone, and there was a positive entity there. It was now getting late, so Hans led us through Zürich and set us on our way toward Bern, where we hoped to find the town where Markus lived, and to see the Continental CB. Markus and his family had us to their home, and his talented wife gave us our best meals of the trip. We found Markus’ house, not without a bit of work, and next day Markus took us to the farm where the CCB is located. There was a bad line through the farmhouse, which we treated with 6-TB method, and there was a vortex on a hill not too far away. But of course the most interesting thing was the CCB. There is a group of four CBs, with huge crystals in the center. Here is a photo when first constructed last year. But it did not seem to be working quite as well as it should. After we arrived, we looked at it carefully, and noticed that in each CB the six pipes were connected at the top by copper bolts. This was interfering with the operation, so Markus and we removed the bolts, and the structure became considerably more positive. Our trip had been undertaken to create a positive canopy of qi over central Europe. But although the canopy had been begun at this point of our journey, it had not yet extended to the area over the CCB. However, when we left the premises that afternoon, there was a disk of positive qi high in the air above the CCB. From there we turned back towards Germany, passing through Basel and Karlsruhe, completing a circuit be returning to Heidelberg. We rested a day there with von Grauenstein and his mother. Due to our rapid pace, we were getting low on TBs, and so we made more with von Grauenstein, along with a couple torsion CBs, and CB-Ray came up for an afternoon to assist. We had accomplished what we had set out to due in half the expected time, so we decided to make a second circuit, north and back to attempt to spread the canopy over the heavily industrialized Rhine-Ruhr region. We cut around to the east of Frankfurt and up north to Hanover. Our greatest adventure was in the remains of a small old cathedral hidden in the forest atop a hill. Many of the old castles and churches were constructed on high ground, mainly for defence I presume. But it is also the case that vortices of qi coming up from below tend to surface on high ground. And so one sometimes finds both in the same location. The old churches and monasteries were frequently placed on places of power as well, and this power commonly manifests itself where two lines of qi cross. In a cruciform church, the longer member was called the nave, the shorter member the transcept, and the place where these two crossed was called the crossing. It was not unusual for one line of positive qi to run along near the middle of the nave and one along the middle of the transept: thus the crossing was the place of power. One sees this at St. Paul’s in London, for instance, and in the great cathedral in Cologne. The second leg of our search for vortices was somewhat circular, from Heidelberg up north and east towards Hanover, north and west into East Frisia, and back south again along the German border. The plan was to circumvent the great industrial cities of the Rhine-Ruhr region. On this leg we came upon the ruins of one of these old churches – built on not such a grand scale as the two mentioned, but neither was it small, and the plan (with respect to the earth lines) was executed quite nicely. At this period of the trip we were trying to find a vortex every 40 kilometers or so. It was a gray overcast day, and we were coming down towards a village, having just visited a vortex about 10 kilometers back. Behind the village was a small mountain and it was plain that somewhere on the mountain was a vortex. Normally we would have passed it up, since it was so close to the previous one, but for some reason we decided to look for it anyway. Cesco found a road behind the village leading up the mountain, and we were able to drive up quite near to the vortex apex. Near where we parked the car was this grand old cruciform church, with roof still intact but with no glass in the windows and obviously long abandoned. While I was tying on my boots preparatory to finding the the exact location of the vortex, Cesco walked up to inspect the church. He told me later that, after he had entered the structure, a positive entity within approached him asking for help. As I walked up the incline I found to my surprise that the vortex was somewhere in the church. Upon entering I found that the apex was, in fact, exactly at the crossing. Furthermore there were lines of qi running along the nave, and along the transept, crossing at the vortex apex. This was the first and only time on our trip where a vortex happened to be on the crossing of two qi lines. The local Lions Club had erected a sign on one of the walls of the church telling of its history. From earliest recorded times (in this case the times of the Romans), there had been a building at this place. At the beginning of the Crusades there was a castle, apparently owned by a robber baron, which was torn down by the King Frederick Barbarossa. I have forgotten when the present building was established, but it was abandoned early in the 18th century. The paving stones or bricks on the floor were gone, and the floor was dirt, but the walls and ceiling were still in good condition. Normally at places of power whereon religious edifices are built, the qi is of a positive nature. And the qi running along the transept here was so. But that running along the nave was not. It was negative, and so we walked outside to investigate. Someone had placed a stone on the qi line, just outside the main entrance to the church, and a date was engraved on it: 184?. So this stone had been placed there over a century subsequent to the abandonment of the church. We used the the 6-TB method to try to heal the qi line, and it worked. Now both lines were positive. We walked back into the church to the opposite end of the nave, to look around. There, at this end, where I suppose in former times the altar had been located, was a picture of Jesus and two women, presumably the two Marys. Here were old and new flowers, showing that some pious people still visited the place for worship. Near the picture was a quite positive entity – perhaps the one who had appealed to Cesco earlier. But between this positive entity and the crossing was a powerful negative entity. And it was quite angry. I ignored it, and with Cesco, climbed up the spiral staircase of a tower which led up to the roof. After we had looked around, we returned below, where the inhuman unpleasantness yet raged. And then appeared another being, but this one had a much more human feeling about it. It was stern, strong, and yet showed reverence and respect for the positive entity. It took on the negative entity, and as nearly as I can tell, destroyed it – or at least removed all the qi from it, so that it was no longer detectable. It was to me the most interesting experience of the trip. But being involved at the time, and being gifted with a defective memory, I have by now forgotten most of the details. However, when it was over, and the stern entity had departed, the qi in the church had become light, and bright, and joyous. And so we left to seek the next vortex. In Hanover Serpentina and her daughter graciously put us up, and she invited a number of other gifters in the city over to meet us, and we had a generally good time. Next it was up into East Frisia, where we met the redoubtable Tapiers, at whose very nice house we rested for a day. Then it was down south again, through the flat country. In hill country, it is relatively easy to pinpoint vortices, for they are most often on the high places, and one can see where the qi hits the surface. On the flat it is more difficult, because the vortices are also on the flat, and though the direction be apparent, it is difficult to tell how far away they are. So one must sometimes drive around a bit until he homes in on the target. One of them turned out to be on a dyke, bordering Holland and Germany, and was actually on the Dutch side of the border. This led us through a small Dutch village, quite different in character from the German towns we had been passing through. Gifting in the industrial areas further south was more difficult because of the urban setting, but we made our fairly rapidly back to Hahn, finishing a second circuit. We still had the better part of a week remaining, so we decided to attempt a third circuit into France about Paris. So it was off through Luxembourg, into France, around the capital, into Belgium, down through …, and back to the Frankfurt area. In Luxembourg or France, I don’t recall which, we found a vortex in an old abandoned fort. I suspect it was one of the cogs of the Maginot line, built after WWI to guard against a German invasion. It was a creepy place, and the usually intrepid Cesco was not too enthusiastic about sleeping there. I agreed and we went somewhere else for the night. I neglected to mention that we had found a third river of qi in the western part of Germany, just before returning to Heidelberg on our first circuit. It flowed thence to the west. On our trip north from Paris to Belgium we crossed under it, and so we know it reached at least two thirds of the way through France towards the Atlantic. One night we splept in the car in a parking lot near a school in Versaille. Some police came in the middle of the night, flashed their lights inside our car, apparently coming to the correct conclusion that we were harmless, and drove on. Our only other contact with police on the trip was in Germany, just the day before we left. We were both pretty scuzzy looking at the time, having not had a bath or change of clothes for some days, and I drove into a station to have the car filled up with fuel. Coming out after paying, I saw that Cesco was speaking with a couple men and a woman. Turns out they were plain clothes police, who had picked us out for possible drug peddlars. They warned us to show them any stuff we might be carrying, saying they had a dog which could smell it out. We of course had nothing to show them, but they painstakingly searched our stuff. I felt sorry for the woman who had to go through my dirty clothes. They were curious about the TBs we had left, but we told them they were feng shui devices, and they seemed satisfied with that explanation. Eventually they figured we were harmless, if a bit odd, and sent us on our way. Here is a map showing the approximate area of the canopy when we left Europe. After catching up with work at home, I left in mid-September to meet Ed in Japan. He put up with me in Kyoto for a full month, while we worked to gift the southern half of the island of Honshu. Ed lived in an old-style wooden Japanese house built in the early part of the 20th century, with tatamis, an indoor privy, spiders, a loft, and shoji doors. It was part way up a hill, which require a bit of effort to reach, and so anyone living there was kept in reasonable physical condition. Ed’s CB was further on up the hill, and when he took me up to see it, he surprised me by holding up a stick to push spider webs out of the way. “What a sissy!” I thought. But I was using the same technique myself within a day’s time. The spiders were numerous along the wood-paths. In the early part of the year Edslist visited the Crofts in Moscow and Laozu was fortunate enough to meet him. Ed invited Laozu to visit him in Japan and thus initiated the sequence of thought which led to the European trip and more recently a trip to Japan two weeks ago. When Laozu’s plane neared the coast of Japan, he was struck by the negativity of the qi in the skies: worse than he had ever seen before. It was not just slightly negative, which seems to be the common condition before presence of a positive canopy, but negative to the point of causing pain to entities abiding there. The island of Honshu of Japan contains two of the most densely populated areas in the world: the Kanto area , which includes Yokohama and the present capital Tokyo; and the Kansai area,with Kobe, Osaka, the ancient capital Nara, and the old capital Kyoto (from the eighth century to the Meiji Restoration in the middle of the nineteenth century). It was the latter region into which Laozu;s plane entered, from the Pacific into Osaka Bay and thence to Kansai Airport. To the north of the Kansai lies mountains, and then the Wakasa Bay region with its many nuclear plants, and then the Sea of Japan. Because large metropolitan areas seem to be a magnet for negative qi, and because neclear reactors create negative qi, this whole area from south to north seemed to be a good place to create a new positive canopy, if possible. There are many Shinto shrines in the region, and forests of cedar and pine in the mountains which come right down to and intermingle with the cities. Vortices tend to surface in the high places, and so Ed and Laozu were to be much among these things in the next two weeks. Most of the shrines housed respectable entities, some holy. One of these was right by the second vortex Ed and Lauzu visited. This one was special, as was the church Cesco and Laozu had visited a month and a half earlier in Germany. But as during that trip, there was only one vortex which was situated at such a point. Work was commenced in the Region west and north of Kyoto, and thence to mountains further north and to the west of Lake Biwa, Japan’s largest lake. One experience which will stay with Laozu for as long as his memory remains intact occured on one of these mountains. He, Eddie, and a Japanese friend took a gondola car to the top of this mountain, and saw that the vortex sought was not there, but on a neighboring peak. So they climbed down the one, and up the other, the last part of the trip bushwhacking with no trail. By the time they had retraced their steps, the chair-lift was no longer in operation, and so they had to walk all the way to the bottom of the large mountain. It took about an hour and a half, the last half hour in near darkness. Finally the trail opened up onto an old road and the hikers could remove their concentration from the ground somewhat. Above was a full moon: huge and orange, with its reflection on Lake Biwa down below, long, rippling, and beautiful. The Japanese friend said that this was unusual, and in olden times would have required compostion of a heiku. While he and Ed were looking for their cameras, Laozu turned around toward the top of the mountain they had been descending to check out the qi from the new vortex behind. And then a tall positive entity appeared at the top of the mountain, apparently looking down upon them, so respectable Laozu must needs get down on his knees. It turned out that that vortex was not the usual kind that swirls qi high directly up, but of that sort that sends a river of qi off in some direction. Here it flowed south, over Kyoto and Osaka towards the Pacific. The next morning there was in the sky the beginnings of a positive canopy, in the shape of a narrow triangle, one of whose sides was bounded by this river of qi. Next Ed and Laozu went north to the Wakasa Bay region, gifting enough vortices along the coast to enclose most of the nuclear plants. The last one was mountain on a peninsula and the climb was begun just before dark. The trail ran out about three quarters of the way up, and the slope turned to about 45 degrees. Earlier in the day Ed had found at one vortex site a snake skin about 7 feet long. Laozu thought of this snake as he crawled on all fours up this slope, piercing big spider webs with his head. Ed waited below at the end of the trail with his friend, building a small temporary fire to discourage the mosquitoes which had come out for dinner. Next day the sky was a little less negative and the entities less in pain, but it wasn’t untill the region on the east of the Kansai, including Nara, had been gifted, that the canopy really opened up and the painful negative qi disappeared. The last few days involved gifting both sides of Osaka Bay, including an island off the coast across from Kobe, which the gifters reached by ferry. The final sortie was to Mount Kokko north of Kobe and west of Osaka, where the vortex turned out to be on a golf course, but fortunately out in the rough, where Laozu picked up a couple golf ball souveneers. Yesterday Laozu noted that positive qi was just entering the tips of the trees, penetrating about an inch. The timing for this to happen was very similar to that which he had observed in Heidelberg a month and a half previous. This morning was wonderful, for there were real sylphs out, all over the sky above Kyoto and to the east: wispy clouds with positive enities in such number as Laozu had not seen since that day in the Palouse fourteen months ago, the day previous to the formation of the first positive canopy he had seen. Why were the skies above Japan so negative? We had to go to Hiroshima to find out. Laozu had thought these past few weeks about what might be the reason for these bad skies. One possibility which occured to him was the industrialization combined with the concentration of population. But there were similar conditions in the Rhine/Ruhr region in Germany, and the sky there, though clearly negative, was not nearly so bad as that above the Kansai. It seemed that he was stumped. And then yesterday he got a hint. A clever Japanese inventor Tetsuzi has been working with orgonite. He has posted about his agricultural experiments with it on Greg’s forum and elsewhere. He invited Ed and Laozu to come visit, and so this week Eddie and Laozu traveled to Hiroshima where Tetsuzi-san lives. When they arrived in the city, Laozu was surprised that the qi in the heavens was even worse than it had been in the Kansai. Tetsuzi-san met them the morning after their arrival. It is the custom when visitors come to Hiroshima for their hosts to take them to the the Peace Park downtown. The major part of the Peace Park is a permanent exhibition of the history and effects of the first atom bomb dropped on a population. And it was there that Eddie and Laozu were taken. It is difficult to understand how anyone who visits this place could be quite the same afterwards. At the beginning of August of 1945 the Japanese were fighting a losing war against most of the rest of the world. Their allies Italy and Germany had surrendered in Europe, and eventual defeat was all but inevitable. To insure that the Soviet Union not be part of an invasion force in Japan, and thus be excluded from post war occupation, the US decided to shock Japan into captitulation by dropping an atomic bomb. Supposedly Hiroshima was chosen out of a group of possible targets by the fact that there were no American prisoners of war interned there. There were however Korean and Chinese enforced laborers there and a number of these, along with Japanese Junior High School children, were out working in the city at 8AM on August 6 busy demolishing buildings, so that fire lanes would be open in the event of fires being started by possible American bombing. At 8 o’clock also had the city’s elementary schools begun classes for the day. At 8:15 the US bomber Enola Gay dropped an atomic bomb over the city, which exploded about 650 yards above the hospital in downtown Hiroshima. A pressure of several hundred thousand atmospheres was created and about 550 yards from the hypocenter it struck surfaces with a force of 19 tons per square meter. Most buildings were crushed and and people thrown through the air. The temperature at the center was about 2,000,000 degrees Fahrenheit at the instant of detonation, creating a fireball which reached a diameter of about 300 yards. The temperature at the surface was about 10,000 degrees Fahrenheit, and the people subjected were turned to ash nearly instantaneously. Those people not killed by the concussion or heat within about 4000 feet from the hypocenter were subjected to such extreme radiation that most died within a few days. By the end of 1945 the death toll had reached to about 140,000 out of a city which had had a population of about 350,000. And many more died later of after effects such as various cancers and leukemia. All this was explained at the exhibition hall, along with much other detail, models, and photographs. But what was not explained, because it is not generally known, is the damage done to the etheric realms and their resident entities up in the heavens above. But Laozu had observed, before entering the exhibition, that the entities in the sky were in considerable pain. And so he observed with care and curiosity the photographs taken of the sky before the explosion, during the explosion, and afterwards. The pain was not present in the “before” photos. In fact the sky felt much the same as it does now in most places where there is no positive canopy overhead. And just after the explosion, when the mushroom cloud was expanding, there was still no visible pain in the sky above the clouds. But in the photographs taken after the fireball had consumed itself, and the destruction was complete, the sky was horribly negative, much like it appeared when Laozu entered the city nearly 60 years and two months later. This made him quite curious to see photographs of the sky during the intervening years, to see if the etheric state of the heavens above Hiroshima had remained more or less constant over time. Tetsuzi-san said he would try to find some and send them to Laozu, but it will likely be some days before they will be available. So it may be that the bad skies over the Kansai, and the worse skies over Hiroshima were effects of the atomic bomb explosion over Hiroshima, and later over Nagasaki. Later in the day Ed and Laozu visited Hiroshima Castle. This castle was a national monument which had been destroyed by the blast, but later rebuilt by the Government. While the visitors were on the grounds heading for the entrance, several sylphs appeared, their bodies in pain, but their heads in positive qi as usual. It seemed like a greeting. From the top floor of the castle was visible most of the city and its suburbs. In particular there were visible two vortices, on opposite sides of the city. Later that day, at dusk, Tetsuzi-san drove them to one, and on the morrow, to the other. Thanks to Tetsuzi-san’s knowledge of the city and his kindness, Eddie and Laozu were able to initiate the process of returning positive qi to the city’s skies. On the way back to the Kansai, they and another Japanese friend stopped every so often to gift a vortex with the intention of extending the positive canopy begun earlier, all the way to Hiroshima. Before gifting in Hiroshima, while walking through the moat-enclosed grounds surrounding Hiroshima Castle, a sylph appeared to them above in the tortured sky. The upper right part of the cloud, wherein is the consciousness of the sylph, exhibits the usual positive qi (which is much stronger and nicer than that of any human Laozu has ever met). But towards the lower left in the cloud there is pain. Later I went to Nagasaki for comparison. Ed and Laozu visited Larry in the Nagoya region this past week, and the positive canopy has now extended over that area. Larry was an excellent host, permitting Laozu to stay at his home overnight, driving him to a critical vortex site northwest of the town of Toyota, and setting him on the train to Nagasaki. Since the sky over Hiroshima was the worst he had seen, Laozu naturally wondered if that over the other city subjected to nuclear explosion would be similar. He was rather surprised to find that it was not. The sky was negative, more so that one would expect to see in the US or central and western Europe, but not nearly so negative as that which Laozu saw in Osaka when first he arrived, and much less that it had been over Hiroshima. The Nagasaki bomb, dropped three days after the Hiroshima bomb, was somewhat different, based on plutonium. Also there were fewer immediate casualties: about 70,000 I believe. This is not meant to understate the gravity of the destruction of Nagasaki. The photos in the museum near the Peace Park there are horrible. Laozu found one vortex in the city, and since he was on foot this time, that was all he could handle. It’s location was a small mountain not all that far removed from the hypocenter of the explosion. Some hours later, after visiting the museum and boarding the return train, Laozu observed that though the state of the lower sky had not changed much, the upper heavens had begun to turn positive. On the way to Nagasaki (which lies on the western island of Kyushu), and on the way back, Laozu passed through Hiroshima. He was able to observe that the possitive canopy had reached Hiroshima from the Kansai, and now extends nearly 70 miles west. Eventually the time to return came, and Ed chose a wonderful location for our final outing. On Laozu’s last full day in Japan, Eddie and friend took him up a beautiful trail to the top of a mountain some distance west of Lake Biwa. The weather was beautiful and the sky blue, with the chemtrails not sticking. The extent of the positive canopy in Japan, as nearly as Laozu could tell when he left, is outlined in red. Most of the information that i’m posting now was lost on the ethericwarriors site, so i’d like to get it back in the public record. Before Laozu arrived in Japan, I had only met him for a grand total of 10 minutes at Don Croft’s place in Idaho. During that brief conversation, I invited him to Japan, and thankfully, he took me up on the invitation. In preparation for gifting the vortices of Japan, he shipped off 2 boxes of TB’s well in advance of his arrival. Neither box arrived by the time he did. Fortunately I had enough TB’s around to get started, and it seemed as if there was an endless supply to draw from, and I kept finding just enough before each new gifting day. When those ran out, we made more (and 2 TCB’s as well). Laozu would spot a vortex (or rather, feel it) on top of a hill or mountain and we would be off trying to get as close as possible by car, and then on foot, usually scrambling through dense brush, but sometimes following a well-marked path to a Jinja shrine or Buddhist temple where the vortex would be conveniently located right on the temple grounds. When we came across a shrine or temple, Laozu sometimes would feel the resident Spirit of that place. He startled me and my friends on several occasions when he would break into beautiful song in respectful communication with this local Spirit. The language of the song was unknown to me; it seemed to contain elements of both Chinese and Japanese phonemes, but Don posted that it might be an Andromedan language. On Laozu’s last full day in Japan, my Japanese friend and I showed him a series of beautiful waterfalls where I have hiked, camped, and gifted many times before. I had been meaning to take him there since he first arrived, but circumstances seemed to prevent it until the last day. As luck would have it, he felt the presence of a vortex at the top, and we were off on the hardest scramble so far through dense brush. We were rewarded with a parade of Sylphs at the top and the photos are already part of this thread. On the way down, we stopped at a waterful where I have camped and gifted before. Laozu felt the presence of an Undine, so I asked him to ask this water Spirit if my TB gifts were appreciated. I saw Laozu almost get bowled over with the reply, a forceful, joyful ''Yes"! That for me was a wonderful confirmation. During his stay in Japan, we spent nearly every day gifting vortices in both remote areas and downtown urban areas. I’d like to express gratitude to my Japanese friends (who prefer to remain nameless) and to Larry in Nagoya for their wonderful generosity in helping Laozu. The skies above Western Japan are no longer in pain. On the trip home from Japan, my plane flew into San Francisco, and so I was able see the state of the skies there as of mid-October 2005. The skies there and then were covered by positive qi. Thus this map is now somewhat obsolete. On October 23 I crossed the State (Washington) to Seattle on I-90 and so had opportunity of observing exactly where this second river of qi passes south to north. It crosses I-90 between Ellensburg and Cle Elum. The map has been altered by the addition of some purple ink in the middle of Washington State to indicate the location: as usual the solid line represents actual observation, and the dotted line extrapolation. In May of 2005 I had visited an old friend Luke from Taiwan, who had come to the US (Las Vegas) on business. After he left, I spent a few extra days visiting Lily and the Count there, and we went gifting a vortex just on the outskirts of the city. It was hot, and I was out of shape and improperly clothed for the trip, and so I had to give up on the first attempt. The second attempt the next day was successful however, thanks to my hosts, and but for a bout of sand fleas, I made it successfully back home. Luke suggesting I visit him in Taiwan, and after the successful Japan trip, it came to me that I should take him up on it. My good friend Wong, originally from Hong Kong, had become interested in helping with the vortex gifting, and had bought my airline tickets to Europe and Japan for me, and Luke bought my ticket to Taiwan. It was quite a successful trip, but I found the semi-tropical flora of the island more of a challenge to penetrate and navigate than any I had had experience previously. Laozu traveled to the island of Taiwan the first of November to try to get a positive canopy of qi started there. Many people helped him on the trip, but foremost was an inventor and ME professor at China Institute of Technology in Nankang, Su Jing Song. Mr. Su furnished plane tickets and paid the expenses of getting orgonite to the island, as well as driving Laozu to many of the vortices gifted on the island. And he helped build and is now the owner of the first CB in Taiwan. Laozu also wishes to thank Professor Zhuang Zhenliang of NTU in Taipei and Chang Pintsun of Academica Sinica in Nangang for much help, especially driving him around the city of Taizhong and bringing him to three vortices in that area. Mr. Chang also provided lodging for six nights. And Professor Chen Jinzi, also of NTU, provided lodging for most of the rest of Laozu’s stay in Taiwan, as well as driving him to vortices in eastern Taipei and in the Yang Ming mountain area in the northwest part of Taiwan. Laozu was in Taiwan for two weeks, gaining intimate experience with various flora and fauna of the island: especially the local version of nettles, mosquitoes, and a type of thorn that attaches to skin as if it were some sort of animal. Laozu was warned of aggressive 2 inch long bees which have killed three or four people this year, but fortunately he never ran into any of them. The most populated three fourths of the island was covered (all but the southeast part). By the end of the first week the canopy was present over Taipei (the capital city in the north part of the island), and after two weeks the canopy had spread to the south: to Jia-yi, Tainan, and Gaoxiong. It was a successful and interesting trip, although the weather was hot and humid, unusually so for this time of the year there. The qi in the heavens in Taiwan was not so bad as it had been in Japan a month and a half earlier, put perhaps a little more negative than that in the heavens above most of the US. On the trip back I found that the positive canopy had stretched farther than I had any right to anticipate, based on preious experience. Laozu returned home this evening from a two week visit to Taiwan. More on that later, but today he observed some interesting phenomena on the second leg of the plane trip: from Tokyo (Narita) to Seattle. In the map posted several weeks ago, an area in the sourthern Japanese island of Kyusho (around Nagasaki) was indicated as being covered with positive qi. This area had only one gifted vortex, and that on the top of a small mountain within the city limits. When Laozu left the city (the same day he gifted the mountain), he was rather surprised already to see positive qi up above. It was higher, and thinner and weaker than the qi over the Kansai (Osaka) region, but it was there none the less. This morning, when changing planes in Tokyo, Lauzu was surprised that the sky over Tokyo was covered with similar positive qi – especially since no vortices in the Tokyo region had yet been gifted. He guessed that it had likely flowed up there from the Kansai region to the southwest. So when the plane took off from Tokyo/Narita, Laozu intended to watch carefully how far this high canopy of positive qi would extend into the Pacific to the east. He was rather surprised to find that it wasn’t until the plane reached a region southest of the Kamchatka peninsula that he could detect the edge of the positive canopy to the north. In the map below the approximate plane route is indicated by a red line. The solid yellow line approximately indicates the observed northern boundary of the positive canopy, and the yellow dots indicate area where the positive qi was observed today. The snow months were again back in the Palouse, and so vortex gifting was put on hold until February. Georg, who has done so much with orgonite in South Africa, had several years earlier invited me to visit. It came to me that now was the time to take him up on it. Winter had seemingly left the Palouse hills towards the end of February and, with it, some of Laozu’s immediate responsibilities. It seemed the right time to accept Georg Ritschl’s long-standing invitation to visit Africa and attempt to open a positive canopy on that continent. So with Georg’s encouragement and kind invitation he traveled to Johannesburg, and the work was begun the next day. For about five days Georg drove him about the greater Johannesburg-Pretoria area and suburbs, gifting dormant vortices, and at the end of that period a positive canopy of qi was present over the region. The most interesting vortex they found however, was not one of the type described here before. They stopped at a gem store northeast of Joburg and the owner told them of a vortex some Peruvian shamans had reported being stronger than anything they had seen in Peru. He wrote some directions on a map, and Georg and Laozu found what they think was the place. It was up in a natural amphitheater on a mountain in the Magaliesberg range. There was already a swirl of qi around the amphitheater (clockwise looking down at it), but it did not feel good under the ground. While they were resting after the climb, high-level assistance came to direct Laozu to place the TBs in the proper places. Directly Georg remarked on the increase of “energy” at the site. However there was still quite a bunch of negative entities about, and more help came to assist with their disposal. Typically, when a vortex is stimulated with TBs, a swirl of positive qi rises into the air spiraling up. With this vortex, at least while Georg and Laozu were present after the gifting, positive qi poured out of the sky above into the ground near the center of the amphitheater–but not spiraling. The shape of the space in which the qi was pouring down was conical, but the sides were steeper than the cone of the up-spiraling qi of a normal vortex. The pair intends to return after it stabilizes in a week or so, for further observation. This was indeed a quite unusual vortex, as we found driving down from the north from Zimbabwe about a week and a half later. A canopy of positive qi having manifested itself over the Johannisburg metorpolitan area, it became necessary to undertake a more extensive journey. Georg told Laozu of his earlier busting expedition up into Zimbabwe (formerly Rhodesia), and particulary of his memorable experiences at the grave of Cecil Rhodes in the Motopos hills and the Great Zimbabwe ruins not far from the city of Masvingo. He suggested a vortex hunt which would include those areas. Laozu concurred, and so Georg planned a route, roughly the shape of a parallelogram, which would stretch from Joburg north and west to the Botswana border at Lobatse; thence north and south through the Botswanan capital Gaborone, through Francistown up to the Zimbabwe border south of Bulawayo; thence east to Masvingo; and thence south and west across the South African border through Messina and Nystrom back into Johannisburg. The width of the parallelogram would be about 300 kilometers and the height about 800, covering an area of about 80,000 square miles. The plan was to create a string of opened vortices, about 30 miles apart, circling the area, which would exend the positive canopy over the whole region. Laozu thought it a good plan, and so they set out. The vortices were too many to describe here, and so Laozu will only write of the more memorable ones. They did pass the Magaliesburg vortex (mentioned above on the first leg of the journey), and found it operating much as before, except a bit stronger. One vortex some way after that was situated on a high hill in the bush on private property. Laozu had just clmbed over a locked gate when the owner of the farm drove up. Fortunately the farmer and his wife were very gracious, unlocked the gate so Georg could drive Tata II (Georg’s pickup) onto his property closer to the hill, and left the key with Laozu and Georg to lock the gate when they left later. This was somehow characteristic of the trip to come, in the kind treatment they were to receive throughout the trip (with exception of the Zimbabwean borders). In this first leg of the trip the vortices generally required more effort to reach since the country was hilly and vortices tend to be on hills when such are present on the landscape. Georg however, perhaps from his many missions gifting towers, has a gift for driving where he wants to go, and that saved considerable time. One of the high points, from Laozu’s point of view, was meeting with a Kudo in the bush hiking in to one vortex. The pair crossed the South Africa/Boswana border about dark, and passed the first night in a motel on the Botswana side. In general Georg and Laozu made good time throught Botswana. The terrain was somewhat more level and it was often possible to find vortices closer to the highway. And when the pair had to leave the main road, there was often a farm road with an unlocked gate. The people in Botswana were friendly, and seemed to be on the way up economically. The capital Gaborone was busy and growing. Somewhat north of that city there was a vortex on a hill not far from the road, but the place was gated and fenced. Georg and Laozu drove in and found workers ready to go out into the fields. It was a Government farm, and strictly vistors were not allowed there, but Georg spoke with several of the workers about the vortex mission, and a couple of those who seemed to have more responsibility than the others told him that he and Laozu could climb up the hill. It turned out that the vortex was not far up the hill, and upon return, a number of those still at the living quarters in the farm curiously came out to see the pair. Georg explained about what orgonite does, gave one of the men a TB, and soon most of them wanted TBs. There were not enough for everyone, but quite a few got them. It was marvelous to see how accepting they were of the concept. The last vortex we gifted in the evening was out in the bush, but there was a nice open flat space and Georg and Laozu decided to use the good weather and camp out. It hat been raining off and on since Laozu’s arrival and only that day had he weather been really fine. Georg cooked a good dinner over the cook stove and set up the tent. Laozu tried to start a fire, but the wood was too wet so Georg poured on a little diesel and the two enjoyed a campfire into the evening. Just before bedtime the wind came up a bit and a thunder and lightning storm blew up off to the south, where the gifted vortices were strung out. After enjoying the spectacle for an hour or so, the two jumped into their sleeping bags and Laozu (at least) fell asleep immediately. Sometime later he was awakened by the tent blowing and the sound of heavy rain drops. Gradually it turned into a downpour, and by morning water was under and in the tent, and in the sleeping bags. The dirt road out was a mess, and Georg had to walk to the highway for help, and fortunately found a couple in a 4X4 who came to try to pull us in. But the 4x4 almost got stuck. After an amount of digging (with a TB trowel) and various unsuccessful muddy expedients, more people showed up with a regular shovel. About five huskies (including Georg) lifted the left rear quarter of the pickup off the ground so that tree branches could be thrown under the wheel, and eventually we got out and back to the road. The rest of the day it rained, but we managed to get our gifts placed (though in one cornfield Laozu had to wade in up to his knees). The day was concluded by a three hour border crossing into Zimbabwe. The Botswana side was no problem, but the Zimbabwe side was bad. Georg had to undergo most of the trouble, so it will be left up to him to discuss it elsewhere if he chooses. One of the problems was the currency. Inflation was so bad that Georg had to pay 482,000 Zimbabwe dollars just to purchase obligitory highway insurance. And the exchange did not even issure the actual currency – just checks for the currency, checks which had already exprired formally at the end of 2005. Not far from the border the pair found a motel to stay the night, and try to dry a few clothes. I neglected to mention that several years earlier in Georg had given a CB to a man in rural Zimbabwe, and that we drove in to visit him and inspect the CB. Due to the muddy road, we could not drive all the way, but had to walk the last half mile or so. When we got to the place, the man was not there, and the residence seemed abandoned. But the CB was still there, and even protected by a small fence, and was working quite well. Quite inspiring. The next morning it was drizzling as Georg drove into the Matopos hills. The first lengthy stop was the huge rock formation which holds the graves of Cecil John Rhodes and his henchman Leander Starr Jameson. Several years ago Georg had made friends with a noted Matebele rainmaker in he area, and in the pickup was a CB which was intended for the man. Luckily one of the attenents at the grave-rock knew the man. He told us that the man had died but agreed to take us to his widow, and to his successor, late in the afternoon. Laozu found that part of the trip quite interesting, but will leave it up to Georg to tell what he thinks is appropriate. The rain and wind had turned stormy, and the guide-gatekeepers were more than willing to let Georg and Laozu climb up to the graves themselves, and indeed they had the place to themselves. Georg had gifted the place when he had visited before with TBs, but this time, with no observers, the two were able to secrete an HHG quite close to the grave. Laozu noticed that there were two qi lines crossing over he rock. One, a positive one, passed close by Jameson’s grave. The other, a negative one, came from a sort of valley in the distance, but crossed the first twenty meters or so from Rhodes’ grave. Laozu also noted than there was a dormant vortex not too far away in the hills. After descending the grave rock, the two went to an inconspicuouis place on he negative line where there was sufficient soil to bury a ring to 6 TBs and so change the character of the line to positive. After getting permission from the caretakers to roam in the hills, the two headed off for the vortex. This was on the top of a hill some distance away, and Laozu found it most interesting. For he top of the hill was ringed by a circle of rocks which made it look like a fortification or a ceremonial place. And indeed after the vortex was gifted, the two were visited by a high-level positive entity who inspired Laozu to do some cleaning of the place. Afterwards the pair slogged back to the pickup through the high wet vegetation. While Georg drove off to get a room for the night at the Motopos Hills Lodge, Laozu went up to the grave site again to check on the status of the treated line which had been negative. It was now positive, and Laozu returned to the shed where the ticket sellers stayed and had a chance to look at photographs there of Rhodes, Jameson, and Beit. Upon Georg’s return, the guide who was to lead to the rainmaker’s place came, and the three set off through muddy dirt roads and over dam spillways, where in the rain, the dam overflow was several inches deep flowing over the road. Laozu was glad it was Georg at the wheel instead of himself, and was impressed with his driving under those conditions. The route was retraced in the dark and the two spent the night at the Lodge. There was water leaking in from outside onto the floors, and no running cold water, since the pipes leading from the dam had broken. But the electricity was working and so the pair’s wet clothes could be dried by a small electric heater in the place. Next day was the one day spent sightseeing on the trip, visiting cave paintings, a museum, and places of qi interest. After another night without running water, the pair headed east toward the Great Zimbabwe Ruins. With all the rain, the rivers through that part of Zimbabwe had water, and Georg made sure they(as well as whatever towers had not been gifted before) got TBs. Gifting was good and the two reached the town of Masvingo by nightfall. On one of the vortex hills, Laozu was accosted by a couple of illegal gold miners demanding to know what he was doing up there. And so Laozu explained about orgonite and qi coming up through the ground. They remained suspicious, but one of them led Laozu up a path to the top of the hill, and after Laozu planted the TBs, the miners became more friendly, and by the time the foot of the hill was reached, they had showed Laozu some of the gold they had mined. They received a TB for their house after getting back to the pickup. Next morning they drove to the Great Ruins and were accompanied by an engaging guide who told them much about the history and former uses of the ruins. Their name “Zimbabwe” was adopted by the blacks as the new name for their country after they took over political control of Rhodesia. “Zi” means “great”, “mbab” means “house”, and “hwe” means “stone”. And there was a great stone house on top of a steep hill, the stones being granite blocks, partly hewn, and partly broken by heating and cracking. The ascent was quite interesting, designed so that any unwanted visitors could quite easily be disposed of by dropping rocks or shooting with arrows. There was a cave with acoustics such that words spoken there could be heard down on the the plain below the hill. In that cave were two entities, one quite happy and the other quite sad–the guide explained that the place had been used for ceremonial purposes. From there the three climbed up to the higher place on the hill, where public dances and cermonies had been performed in front of the kings in times past. As Laozu recalls, the place had been used for such purposes from the 12th to the the early 16th century. There was a high concave rock, near to the king’s seat, where a strong positive entity still lingered. It reminded Laozu of the being in the old monastery ruins on Heiligenberg in Heidelberg which Cesco and he had seen last summer. It was easy to see why that hill had been picked for the Great Zimbabwe. Later they came to another part of the ruins down on the plain, surrounded by a great circular wall. Georg had told Laozu that there was something special about the place, and indeed there was a vortex there. By that time, the guide had developed sufficient confidence in Georg and Laozu that he permitted them to gift it. Georg said he would have been surprised if there had not been a vortex there. It was afternoon by the time they left the ruins, and just managed to reach the South African border by nightfall. Again there was trouble “jumping through the hoops” on the Zimbabwe side, but it was not so bad as entering the country had been. On the road south from the border to Pretoria most of the towers had been previously gifted by Georg, so attention was mostly concentrated on vortices. In Botswana and Zimbabwe gates into rangeland had been mostly unlocked, and fences had been low enough to climb easily. This was not the case in South Africa. Especially difficult were the high game fences, often ten feet tall with barbed wire and hogwire on one side, and sometimes electrified on the back. When confronted with these latter, Laozu either looked for vortices elsewhere or asked permission. On one occasion when permission was requested, it was refused on the grounds there was a tiger inside. The vortex hunters were fortunate however, being given permission sufficiently often, and finding non-game fences sufficently often, that vortices were reached with the necessary frequency to successfully complete the circuit. Driving south Laozu could observe that the positive canopy had already spread along their previous route three hundred kilometers to the west. Turning his attention to the far south, he became aware of a large swirl of positive qi far to the southwest. He could feel that qi was dropping downward into the swirl, but rather than depleting the positive qi above, the positive qi seemed to be stronger there than elsewhere. Georg had a GPS device, by the aid of which, it was determined that direction of this positive swirl was quite close to that of the Magaliesberg vortex mentioned above. The closer the two traveled to Pretoria, the more they became convinced that it was the Magaliesberg vortex. I was able to confirm this about a week later when I was in the vicinity of that vortex again. Somewhere between 150 to 200 kilometers from the Pretoria/Johannisburg area they drove under the edge of the positive canopy. Laozu found it unusual that the canopy had spread so far north from the vortices originally opened, which were the source of that part of the canopy. He speculates that the special Magaliesberg vortex, visible from so far away, may be some part of the reason. After coming under the canopy, it was no longer necessary to gift vortices with such frequency as before, and the pair reached home not long after dark. Georg was ill when we returned, and the severity of the illness seemed greater the next day. He in fact was suffering throughout the remainder of my stay, and when I returned home to the Palouse, I came down with apparently the same thing. At first I suspected malaria, but later it seemed that tick fever may have been the culprit, for I did get quite a few tick bites climbing about through the bush. At any event, due to his illness and the many duties which had piled up for him during our trip north, Georg decided to stay home for a few days. During the last part of his stay in South Africa, Laozu borrowed Georg’s TATA II pickup and set off to the south, to extend the positive canopy parallelogram further. It now covers an area approximately 300 km by 1250 km. The corners of the parallelogram are roughly Bulawayo (Zimbabwe) in the NW, Masvingo (Zimbabwe) in the NE, Bloemfontein (South Africa) in the SE, and Kimberly (South Africa) in the SW. I say “roughly” because the canopy actually extends a bit further. On the way back Laozu drove through the town Magaliesburg again and verified that the vortex which had been so conspicuous on the way down from Zimbabwe was indeed the Magaliesburg vortex. It was still the case that qi was pouring down straight into the vortex, but rather than sucking all of the POR out of the area, paradoxically the area was much more positive than usual. It had actually spread south to the town of Kuruman before Laozu came upon it coming north. About a hundred kilometers south of Kuruman Laozu found another unusual vortex. It was almost as if a number of vortices were together, for, instead of there being only one place to gift, there were a number of them, and after Laozu gifted one, the resultant expansion of the canopy covered about 80 kilometers in the period of one night. The only place Laozu was accosted by authority on the trip was by a couple of private patrolmen on the Harmony Gold Mine (owned by the Oppenheimers I believe) not far from the town of Welcom. The soil there was pretty bad. Laozu had to scrub his trowel hard the next day to clean it. When they learned Laozu was on his way out, they lost interest and drove on. Laozu owes thanks to Georg and family for putting him up at their place in Jo-burg, for furnishing transportation and guidance, and for the excellent TBs used on the long gifting circuit. Before Laozu returned from South Africa, he observed the tree tops to see if qi had begun to enter the tips from above. In Germany in August of 2005 the process had begun in less than two weeks, in Japan in September/October it had begun in a similar time period, and in Taiwan in November it had actually begun more rapidly. But in South Africa, after three weeks, it had begun only slightly or not at all. Laozu has been thinking about what might have caused or influenced the delay. It is possible that it might be the large Magaliesberg vortex, where so much positive qi seems to pour straight down into the vortex. This vortex has also caused positive qi to have traveled much further out from the group of vortices than usual. The vortex may have introduced a dynamic into the area which is not present elsewhere. Georg kept a record of the vortices gifted during Laozu’s visit, and pinpointed them on a map. I colored the map with organge to show my educated guess of the canopy’s location at the time I left southern Africa.